Get It Right Mum! | Life Love and Hiccups: Get It Right Mum! Ahhhh, so we have finally managed to get the kids to bed, well after their usual bedtime for a school night,. But given that I didn't even realise until last night that today was in actual fact a school night, I think we will just let this one slide yeah?! You see, I had promised the kids a picnic at the beach for dinner to celebrate the last day of the holidays. And Tuesday (today) would have been the last day of the holidays... if it weren't for the fact that it wasn't. These WHOLE holidays, I honestly thought that school went back on this Wednesday. In fact I didn't just think, I was 101% adamant that it did, despite my husband insisting that he saw a sign at that their school that said "School starts back on Tuesday". I mean, husbands often have a habit of only partially hearing what we say to them right? So I just naturally assumed that he was having a husband moment and had guessed that the sign said "School starts back on Tuesday" when really he didn't see the sign properly. And so Wednesday it was as far as I was concerned. Even yesterday as the kids and I engaged in a particularly enthusiastic game of skim dodge ball in the pool, I teased them with the fact that they only had one more day of the holidays left. Eat your words cruel mother cause you aint getting off that easy! Last night a girlfriend texted me to ask if her son could come home with mine after school and I gave a little chuckle and was all "Oh bless, she's mixed the days up. 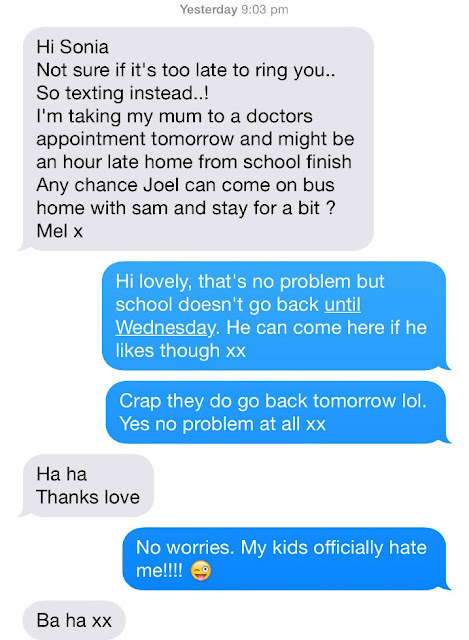 Lucky she texted me or she would be sending her son to school on a pupil free day". But then when the hubby once again raised the "Schools back on Tuesday" sign I decided to screen shot where it said "Wednesday" on the school's website and send it to my hubby and my girlfriend. Only when I checked the website I saw that school indeed go back on Tuesday my smug and somewhat patronising smile disappeared rather rapidly from my face. Not only did I need to reply back to my girlfriend with egg all over face and apologise to the hubby for ever doubting him... I also needed to go upstairs and break the news to the kids who were happily engaged in some late night school holiday PlayStation, blissfully unaware that their precious last day of the holidays was about to be cruelly whipped out from underneath them. No really, they thought I was attempting to pull a really lame one over them... and it was only after they saw me go into a full blown panic over the fact that I hadn't shopped and therefore didn't have like anything in the cupboard for school lunches, no shirts were ironed, and no summer school shorts pulled out of storage... I had NOTHING ready... NOTHING... did they realise I was NOT joking. Better yet, they realised that their Mum is a moron who doesn't even know when school goes back. Devastated would be a humongous understatement when it comes to describing how they reacted. They would have been less devastated if their iPads and PlayStation simultaneously combusted. 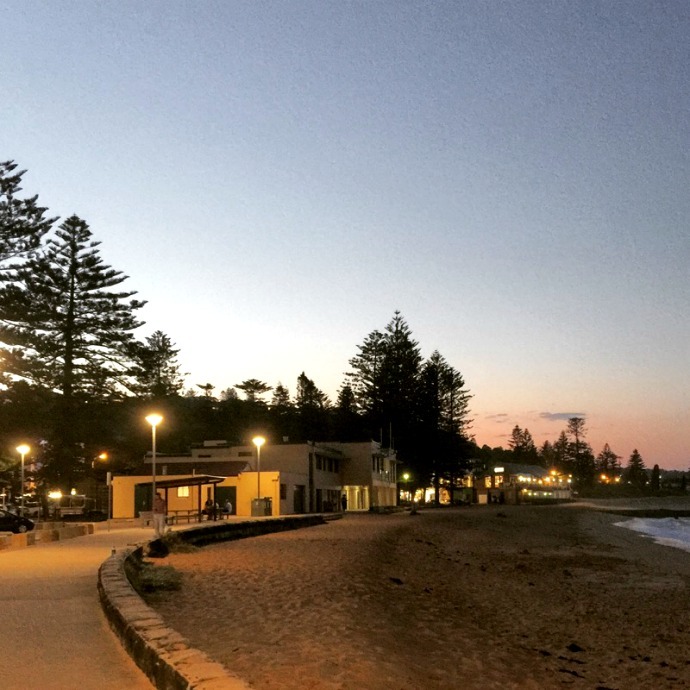 And so we had our picnic dinner at the beach tonight to celebrate the last day of the school holidays... the last day that was actually yesterday but... whatever. Have you ever screwed up the last day of the holidays? Have you sent your kids back early when school wasn't actually on, or have you unknowingly given them an extra day off?